Red Velvet cake just screams Valentine’s Day. It might have something to do with the color, wouldn’t you say? This Red Velvet Cake roll is utterly divine, if you ask me, but if you want something a bit simpler to throw together for a stunning and delightful Valentine’s Day treat, this Red Velvet Cake made in a 9X13-inch pan and smothered in light, creamy frosting is the perfect answer. A bit of a lightened up recipe, the cake is still deliciously moist with the characteristic tang and texture of classic Red Velvet. Combined with the perfect cream cheese frosting and this cake could and should be enjoyed year round, not just on a pink-and-red saturated holiday. Nevermind that when my 7-year old saw this cake sitting on the counter before dinner, he exclaimed, “Mom! Why did you make the cornbread red like that? ?” Oooh boy, we definitely need to get out more. If you are looking for other fun Valentine fare, click HERE! We traditionally do a candle light dinner with our four boys, which they think is, like, SO cool. Gorgonzola Steak Pasta is on the menu this year with a few fun side dishes and this delectable fruit pizza for dessert (or these heart-shaped cream puffs, I haven’t decided yet!). What are your Valentine’s Day plans? Preheat the oven to 350 degrees F. Lightly coat a 9X13-inch pan with cooking spray. Set aside. In a medium bowl, whisk together the flour, cocoa, baking powder and salt. In a liquid measure or other bowl, whisk the buttermilk, red coloring and vanilla together. In a large bowl, using an electric mixer on medium speed, beat sour cream, oil, butter and sugar until fluffy, about 3 minutes. Beat in eggs one at a time, scraping down sides of bowl. Add half of flour mixture and mix. Add the buttermilk/food coloring mixture and mix again, scraping down the sides of the bowl as needed. Mix in the remaining flour until just combined. In a small bowl, mix vinegar and baking soda until mixture fizzes then quickly fold into batter. Scrape the batter into the prepared pan and tap on the countertop to burst any air bubbles. Bake until a toothpick inserted in center of cake comes out clean, 30 to 35 minutes. Don't overbake or the cake will be dry. Set on a wire rack to cool completely. For the frosting, using an electric mixer on medium-high speed, beat together cream cheese, yogurt, butter and vanilla until well combined and smooth. Slowly mix in powdered sugar. When the cake is completely cooled, spread the frosting over the cake, cut into pieces and serve. If not serving right away, store the cake in the refrigerator until ready to eat. Alternately, you can spread the frosting on each individual piece instead of the entire cake. I’m going to make this cake for St.Patricks Day using green food coloring ! Hi there! My daughter wants red velvet for her bday cake — can I make this as a standard round layer cake? And will there be enough icing? Thanks! I’ve never tried that, Amy so I’m sorry that I can’t say for sure how it would work. I think you’d definitely want to double the icing. I know this post is old but I love red velvet cake (as I do ALL of your recipes). I visit your site daily!! Curious if you have ever tried this in a jelly roll pan as a thin sheet cake? Thanks for all your time and effort to put out amazing recipes!! I haven’t tried that, Brittany – but I bet it would work great! Baked this in my bundt pan (350 degrees for 40 minutes) to up the Wow! factor and it turned out fabulous. Delicious, moist and pretty, especially with the cream cheese frosting on top. Thanks, Mel, for another wonderful recipe! Hi! Greek yogurt is not available where I live. What would be a good substitute? Something like sour cream should work. Hi Mel! My mom and I are big fans of your recipes! We were just wondering if this recipe might work for cupcakes? If so, how long should we leave them in the oven? I haven’t tried making these as cupcakes but I think others have in the comment thread if you read through. Good luck if you try it! Could this recipe work well for cupcakes? I’ve never made red velvet cupcakes before and I am weird and have to use recipes from trusted recipe places such as yours! I have never had anything bad from your recipes! They’ve all been great and have turned into family favorites! Thanks for all your hard work! Hi Keri – thanks for your sweet comment. I’ve never made this recipe as cupcakes but I think a few others in the comment thread have done so. Sorry I don’t have much advice for this particular cake! Hey! I was just wondering if this recipe would work in two 8 inch round cake pans? I haven’t tried it that way so I’m not sure how the quantities would work out but it’s worth a try. Good luck! 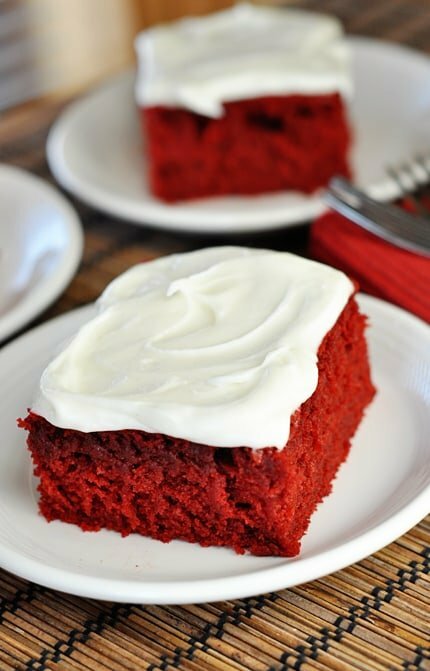 This is the absolute best red velvet recipe I’ve ever come across! It cooked perfectly and is so moist that I can see it staying fresh for many many days. Firm enough to layer and decorate, I made this recipe twice and made a double layer sheetcake and iced it for a birthday. So delicious that i wish I was the birthday girl so I could eat the leftovers! izumi – Plain yogurt usually subs quite well for sour cream so it’s definitely worth a try. Just wanted to report back to let you know that this cake worked perfectly as a layer cake! I baked them in round pans for 37 minutes, and it was perfect. I doubled the frosting but had a good bit left over, so it might not be necessary to double the amount. Thanks for another delicious recipe! Hi Mel! Do you think this cake would be sturdy enough to bake in round pans and stack as a layer cake? If so, I’m thinking I might have to double the frosting amount, but what do you think? Thanks! Hey Mel. I am hoping to make this for my daughter’s birthday, but I wanted to try it in a bundt pan. Do you think that would work with this particular recipe? Hi AJ – I don’t know if this would work in a bundt pan. My gut feeling is there isn’t enough batter to make that work. You might try googling “red velvet bundt cake” to get a better recipe. Good luck! By far the best red velvet recipe I’ve tried!!! How firm is this frosting? Could I use it to pipe on top of cupcakes? Joy – it’s been a while since I made this so I don’t remember exactly. I think it’s on the softer side since it is cream cheese frosting. Erin – it is supposed to be plain yogurt but vanilla should sub just fine. Hi Mel, I’m making this cake for my husbands birthday tonight and I was wondering if the yogurt was plain or vanilla? I have both, just not sure which one to go with! Thanks!!! I made this cake yesterday and it is fabulous, Mel! Very moist and delicious! I cannot comment on your frosting though as I used the cream cheese frosting recipe that I use on my carrot cake instead and it was a heavenly combination. Thank you so much for sharing this recipe. It’s a keeper! Amy – I’d probably bake, let it cool, frost and then store covered in the refrigerator for a day. It will stay more moist if it is frosted rather than leaving it unfrosted for a day. Hope that helps! Mel, how do you store your red velvet cake if not serving until 24 hours later (for a party)? Does the refrigerator dry it out? I was thinking of baking it, and then frosting it 4 hours before serving. I couldn’t help myself, I made it again! I was craving some cake, so thankfully I had all the ingredients – except red food coloring! So I used GREEN! Yummo! I also made the cake last night and I agree with Dena! I took it to work today and got rave reviews along with the strawberry lemonade you posted awhile back. Mel, I’m almost speechless as to how wonderful this cake was. I had never made a cake from scratch that did not come from a box, so needless to say I was nervous. But, it was easy to make! And the frosting…. oh my word… the frosting. I’d never even tried Greek yogurt on its own. I didn’t want to have to halve my block of cream cheese, so I just doubled the ingredients for the frosting. Hands down the best frosting I’ve ever tasted, much less made from scratch! Well, so much for being speechless, eh? LOL Thank you so much for such a delicious recipe! Just made this tonight and it was excellent: moist, flavorful. Don’t change a thing! Thank you so much for posting the pasta recipe!! I just now noticed that. I’m giving it a try. Thanks for always responding to comments!!! Thanks for the quick reply Mel. You’re probably right since it is for 2 people. Jennifer – you know…I’m not sure since that’s how it was in the recipe and I only noticed it because of your comment. Because it is just a meal for two people, I think it is probably 1/2 cup of cherry tomatoes but you could certainly add as many as you like! Mel- Thanks for sharing the recipe. Is that 1/2 pound cherry tomatoes? Hey Mel! We made this in both the sheet cake and then we tried it as cupcakes. We LOVED them both!!! My kids now ask to make it everyday. Hi Ashley – I use a Nikon D90 and use almost exclusively my 50mm/1.8 lens. Hope that helps! I was wondering what type of camera you use to capture all of your mouth-watering food photos? We always do a fondue night. My five range 9yrs to 18 months. They absolutely love it! We try to recreate a Melting Pot kind of experience. They’re already putting their orders in for the things they want to dip! I made this today for our super bowl party. I’ve never been a huge red velvet fan, meaning I don’t usually pick it over chocolate or vanilla, but I couldn’t pass up this recipe. It was delicious!! It was extremely moist, perfectly sweet and the frosting and cake worked so well together. Yum! (PS- I’m not a big cream cheese frosting lover, but this wasn’t over bearing. I loved the addition of greek yogurt, such a great balance). Thanks for the wonderful recipe, yet again! The color of your red velvet cake is so perfect! I love that this is a lighter version and I definitely want to try it. Ditto all of the above comments, enjoy how you celebrate Valentine’s, my mom always made it special also. 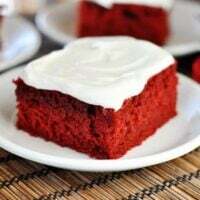 Loving the red velvet recipe, I have only made it once but it is always a fave dining out choice for dessert. Like the frosting ingredients, maybe I’ll be making this tomorrow, thanks. have a great weekend..this cake will be a hit!! a home run……. I wish I could marry red velvet cake but, I’m 100% against putting cream cheese frosting on it! I say you have to go with the full fattening flour, milk, BUTTER stuff. It’s life changing! As in, you’ll love it and you’ll gain 4 lbs in a snap! LOL! dashes of salt and pepper before finishing. Adding salt too soon to mushrooms while they are cooking pulls out their water and makes them rubbery. When water comes to a boil, add the pasta and cook according to the package directions (I like mine a little more tender than al dente so it soaks up the sauce nicely). Remove steaks from oven, tent with foil, and allow 5-10 minutes for meat to rest for juices to redistribute. In a separate sauce pan, combine half and half and Gorgonzola until heated through. Add 2 Tbsp Parmesan cheese and cook until melted and well blended. Remove from heat. Stir mushrooms into the sauce to combine. When steak has rested, cut into thin slices. To serve: Place a serving portion of pasta on the plate. Top with steak slices. Drizzle a generous portion of Gorgonzola cream sauce over the steak. Top with additional Parmesan cheese and tomatoes! Enjoy! This sounds delicious and I can’t wait to try it! Will you share the recipe for the steak and pasta? Love that vibrant color of red velvet cake! SO perfect for Valentine’s Day. 🙂 Have a great weekend. But I bookmarked that Red Velvet roll b/c it looks SO AWESOME. I haven’t decided yet which one to try. I DO love your tradition of celebrating with a special candlelight dinner with the whole family. I just found your awesome blog….I AM A BIG FAN! Totally going to copy your idea and do a candlelit dinner with our 3 boys. So cute. And do you have the steak/pasta recipe. That sounds perfect with your fruit pizza!! Just printed it out. Erin – I hear you on that. It took me a while to get over my phobia of A LOT of red food coloring. Last year was the first time I ever made red velvet cake because of it. You are probably like us – we don’t eat a lot of processed, artificial things (large quantities of food coloring among them) but I also like to run the balance of moderation and since I make red velvet something-or-other about once a year, I figure the coloring won’t hurt us since we aren’t consuming it daily or weekly or even monthly. You might try googling other options, I think I heard once that old-school, authentic red velvet is made with beets to color the cake! You should consider trying Wilton’s Icing color. A one ouncejar is about $1.75 and will make at least two complete cakes. You only need two tablespoons. Just mix with a little water the color is very concentrated. Hello Angela – Mel doesn’t have access to internet right now so I’m helping her out with comments for the next few days. Thank you for the feedback! That sounds like a great idea. Ok, I might be paranoid, but the idea of using an entire bottle of red food coloring makes me nervous. Am I all alone in this freakish misery? This is the sole reason I’ve never tried making red velvet cake. This looks great! Our plans are to hopefully have the Baldry kiddos so mom and dad can have a quiet dinner. Maybe a candlelit dinner with the 5 kids would be fun. I love red velvet but I’ve never tried to make it before…yummy! 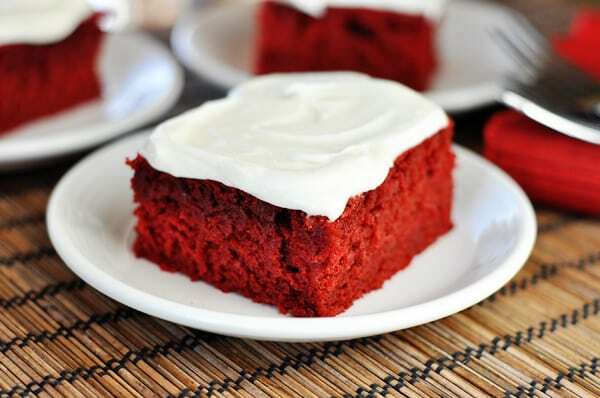 I love red velvet and yes, it is perfect for Valentine’s Day! Like that this recipe is simpler and a bit lighter, too. I am baking this cake as we speak, and it’s bubbling over into my newly cleaned oven! EEEK. Just slid a large cookie sheet on the lower shelf to catch the spillover. I am using a 9×13 sheet pan, just as recommended. Not sure why so much batter overflow!